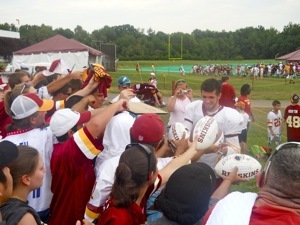 Redskins kicker Graham Gano probably won't be signing autographs for Redskins fans next year. Photo by Mike Frandsen. Is Graham Gano the worst kicker in the NFL? There’s no doubt that he is – the statistics back that up. Gano has missed 10 field goals on the year, which leads the NFL. But a more important question to ask would be: How much better would the Redskins have been in recent seasons with kickers who were merely average or above average instead of bad? Sunday against the Tampa Bay Buccaneers, Gano missed two field goals that any high school kicker should make. Either of the chip shot field goals Gano missed, a 24 and a 34-yarder, would have given the Redskins enough points to win a game that they lost 17-16. Never mind the botched snap and hold on what would have been a game-tying extra point – the Redskins should have never been in that situation. True, it was rainy, but those are kicks that have to go in. In fairness, Gano did kick a game-winning 33-yard field goal in overtime to give Washington a 16-13 win over Green Bay. This brings up an often overlooked issue: the Redskins have had some of the worst kickers in the NFL during the Dan Snyder era, a time when NFL teams have been so close in talent that special teams can make a huge difference. Kick returner Brandon Banks has kept the Redskins in several games this season, but during the previous decade, Washington had one of the worst kick return units in the league, and its punters were nothing to brag about either. This inattention to detail has been symbolic of a franchise that was once known for its blue-collar work ethic, but has gained a reputation of overpaying stars at glamorous positions. Talk all you want about Tom Brady, but he hasn’t won a Super Bowl without Adam Vinatieri. Neither has Peyton Manning. So when you complain about questionable coaching decisions or Donovan McNabb, don’t forget double G.
This entry was posted on December 15, 2010 at 12:13 am and is filed under Uncategorized. You can follow any responses to this entry through the RSS 2.0 feed. Both comments and pings are currently closed.